Chitta is a village near Anoopshahar, an old town on the ­Ganga in Bulandshahr district of Uttar Pradesh. Compared to other villages that meld seamlessly into the western UP landscape, one would find Chitta more than a little unusual. Its neatly organised network of roads and flourishing educational institutions make it seem as if a stray molecule from a developed state has appeared, out of the blue, in this sugarcane belt. The well-appointed university at Anoopshahar, a stone’s throw from Chitta, could give stiff competition to institutions in several metropolitan cities. This bequest of civic and social infrastructure came to Chitta not because it was home to any high-profile politician. Nor was it fortunate enough to be chosen, by dint of some favourable factor, as a ‘VIP constituency’ by some New Delhi bigwig or chief minister. Chitta attributes its flourish to the multi-billion-­dollar industry honcho, Jaiprakash Gaur, who hails from this village. Of late, though, Gaur’s empire—the Jaypee Group—has been hogging the headlines for very different reasons. The group—which has a huge stake acr­oss infrastructure sectors, from roads, power to real estate—has been earning prime-time mentions for amassing a huge debt of over Rs 40,000 crore. Jaypee Group companies figure high on the list of top 20 non-performing acc­ounts put out by the Reserve Bank of India (RBI). And this is after the beleaguered group, facing a serious liq­uidity crunch, reportedly put in huge efforts to more than halve its liabilities from a staggering Rs 85,000 crore. At the centre of the controversy has been Jaypee Infratech, a subsidiary of the flagship that had promised to deliver 32,000 flats and houses to individual inv­estors in Noida. The promise rem­ains unfulfilled, with delays stretching, in some cases, up to five years. Desperate homebuyers, who had put in crores to own their dream houses at Jaypee Greens and Wish Town in Noida, have staged several protests by now. Long-time ­observers would find the turn of events a tad ironic, given that Jaypee’s old brand value and goodwill rested on its record of timely delivery. Now the company owes a total of Rs 8,000 crore to its lenders. The National Company Law Tribunal recently admitted an insolvency petition against Jaypee Infratech filed by IDBI Bank, one of the lenders. A curious blend of ­complacency and overreach, at a wrong time for Jaypee, left it ­vulnerable in a time of ­political flux. The spectacle of investors’ protests and the news of banks closing in on the group have led to a huge erosion in the brand. Everyone in the corporate and financial world is watching, but the reasons for this dramatic slide are a common enough affliction: huge ambition, wrong business decisions and the flippant work culture that seems to have taken over the Jaypee empire. This curious blend of overreach and seeming complacency also happened at a wrong time for the group: exactly when inconsistency in the policy atmosphere, coupled with economic turbulence and political linkages going sour, left it vulnerable. Even amidst all the turbulence, Jai­prakash Gaur, the 86-year-old patriarch, seems to be holding on. A man who once used to ride a humble bicycle, Gaur made it big through sheer grit and hard work that led to the group’s massive expansion. 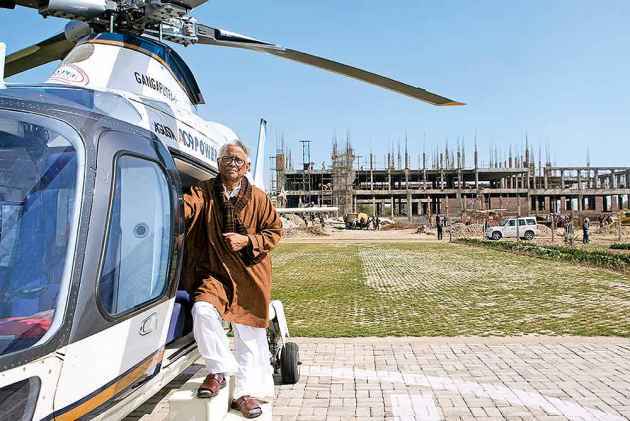 Even today, the senior Gaur, a civil engineer himself, has no trappings of wealth. An eternal optimist, Gaur started off as an engineer in the state’s irrigation department. But soon, he realised the job was ‘very inadequate’ and started off with petty civil contracts back in 1958. The pyjama-clad engineer-­turned-contractor took on the whole gamut of small-time civil construction projects, from earth-filling, canal-digging to riverbund-making. It was only in 1979 that he floated Jaiprakash Associates. Jaypee soon made a name for itself through high-­profile projects, with contracts in the Sardar Sarovar Dam on the Narmada and the Tehri hydel project, which rile environmentalists even today. Several of his business contacts ultimately turned into associates in an ever-exp­anding, sprawling business empire with a footprint in over half-a-dozen sectors. The story goes that Gaur did not hesitate a moment before making an old aide, his one-time co-cyclist, in-charge of the heavy equipment section. Old-timers always held the senior Gaur in huge esteem due to his dedication towards completing projects within the deadline, never letting the mission-mode delivery affect quality. This last trait had, in fact, made the group a sought-after name for irrigation and hydel project agencies. And not just in India. Jaypee made forays into the international arena to create water supply and sewerage infrastructure for the now-trouble-torn Iraqi city of Basra, on the Shatt-al-Arab between Kuwait and Iran, back in the 1980s. The group’s international projects ­ensured sustained foreign exchange earnings. This gave Jaypee enough leverage to get into states and areas with “friendly politicians and bureaucratic linkages”, if long-time group strategists are to be believed. The late Arjun Singh’s ascent in Madhya Pradesh was a timely one for the Jaypee Group, which was in expansion mode at that time. Jaypee set up its first cement plant at Rewa, in close proximity to the CM’s constituency—an area dev­oid of road and rail linkages. That was a turning point—it propelled Gaur to think seriously of extending his business into cement, given the huge boom in infrastructure projects that first began in 1986. After the Rewa experience, a string of cement plants came about. A family insider tells Outlook that Manoj Gaur, presently exe­cutive chairman of the conglomerate, once divulged his father’s plan to set up one cement plant in every state. Manoj, as successor to his father’s mantle, took this seriously and led the push into cem­ent in a big way. At one point, the Jaypee Group had the second largest cement manufacturing capacity in India. But it was under-utilised. Around the same time, Jaypee moved into power and bagged many hydel projects in Himachal Pradesh, Jammu and Kashmir, Uttarakhand and the North­east. The Gaurs also ventured into hospitality and built the Siddartha Hotel in Delhi in 1981. This was soon followed up with the iconic Hotel Vasant Continental in south Delhi’s posh Vasant Vihar, and then the Jaypee Palace Hotel in Agra, plus a hotel ­acq­uired in Mussoorie. In the 1990s, the company moved into road construction—the Gurgaon toll road, done in collaboration with DS Construction, was a high point here, though at one point it pulled out from this project. Yet another road project between Zirakpur in Punjab to Par­wanoo in Himachal Pradesh was done on a build-operate-transfer basis. The run was smooth until the early 2000s. Things started getting edgier thereafter, with peaks and equally huge troughs; mindless expansion and diversification piled on the debt. In the final analysis, over-leveraging the balancesheet strength seems to have messed up group finances, with 27 companies in varied sectors ranging from construction, cement, power, housing, education, IT, roads, hospitality, sports and so on. It was in the late 1990s that the company ventured into real estate—Jaypee Greens in Greater Noida was its first project. This author was witness to Jaiprakash Gaur ann­ouncing the project at Vasant Continental. An integrated plan for towers, a golf course and a res­ort, the project was taken over from ano­ther group, and was already a stressed asset at that time. One can still find some inc­omplete homes in this first real est­ate project with a Jaypee brand. This was, on the surface, the peak time for Gaur senior. In 2001, the then BJP government in Uttar Pradesh, with Rajnath Singh as chief minister, brought out an ambitious plan to att­ract investment in UP with the Taj Expressway and an airport. A big show was organised in a five-star hotel in Delhi for business ­tycoons from UP. Jaiprakash Gaur spoke on the occasion, showing his interest in the project. In 2002, after Mayawati formed a new coalition government, the dream project was relaunched in another Delhi five-star hotel. The vision of a senior and influential bureaucrat from UP, it was a unique project, in which the state would have to make no investment. The concessionaire would build the expressway and, in barter, was to get land parcels along the expressway in Noida, Greater Noida, Mathura and Agra. The company would earn its revenues by developing and selling this land for housing and commercial projects, and collecting toll on the ­expressway. Jaypee got this contract. The group was working very closely with the Mayawati gov­ernment. This coalition government did not survive, however; in 2003, with Mulayam Singh Yadav’s coalition government in power this time, the pro-ject ceased to be a priority. After Mayawati returned to power in March 2007, it was renamed as the Yamuna Expressway and work started in a big way. Land acquisition did create some controversy, but things were favourable for the Gaurs. The company got its land parcels. Then came the 2008 global economic crisis and the real estate slump—the cost escalated many times owing to project delays. But despite the initial slowdown, Jaypee’s offerings were a hit. Wish Town units—hundreds of towers, across a price range of Rs 30 lakh to a few crores—sold like hot cakes. Lower-priced units elsewhere sold out in a few days. Cash was flowing in from buyers in the Jaypee Greens, Wish Town and Aman projects, says a person who was associated with the company. The debt burden was building up meanwhile, as was pressure to complete the expressway. At this juncture, the company announced its Formula One track in Greater Noida. To make the area attractive, it was named as a sports city, with a racing track, a five-star hotel, a cricket stadium and a golf course. The big-ticket F1 and expressway projects meant a sud­den cash crunch. Around the same time, Jaypee also took a hit in the Vishnu Prayag hydro project due to floods. In 2010, Gaur senior handed over control to Manoj, the elder son who had been handling group affairs for a decade—the baton change coming ­exactly when Jaypee’s big gambles were beginning to exact a cost. The idea that Indians would pay over a lakh to watch a car race had its sceptics anyway, a former employee confided to Outlook. The F1 track has seen only three events so far. The expressway too was limping along, and government interest was waning. 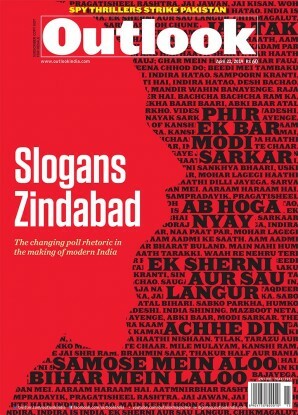 In 2012, Akhilesh Yadav ­became chief minister with full majority—this naturally went against a group that had by now been painted as a Mayawati favourite. “He ran the group just like a ­family ­venture,” says a former ­associate of Gaur senior. According to someone who was associated with the group in a senior position a few years ago, Gaur senior ran the group like a family venture. He tells Outlook that instead of professionals, Gaur’s two sons, daughter, brother’s children, old associates and their children were given important positions. One interesting element to Gaur’s story is that of a celebrated banker. A mentor of sorts, it was his idea that the group expand into cement, power and real estate. Private banks, unusually, also have a lot of exposure in this group. Now these banks are asking for a forensic audit, which essentially signals scepticism about finance being diverted away from the stated purpose. Ane­cdotal whispers also abound about family rivalry, mismanagement, and wrong decisions by senior figures and business associates. One thing is clear: the empire as it stands now is a far cry from the one of Jaiprakash Gaur’s dreams. He maintained good relations with politicians in the BJP and BSP as also the bureaucracy. A person who has witnessed many visits by Gaur senior to politicians and bureaucrats says he is a polite man of the grassroots. Now Jaypee is on the verge of being declared bankrupt, leaving investors in a lurch.